Now through September 20th, enjoy 30% off our best-selling press book and 25% off Custom Book Designs. From seniors to weddings, the Miller’s Signature Book is an affordable lay flat book that client’s love. Upload your session and get started. 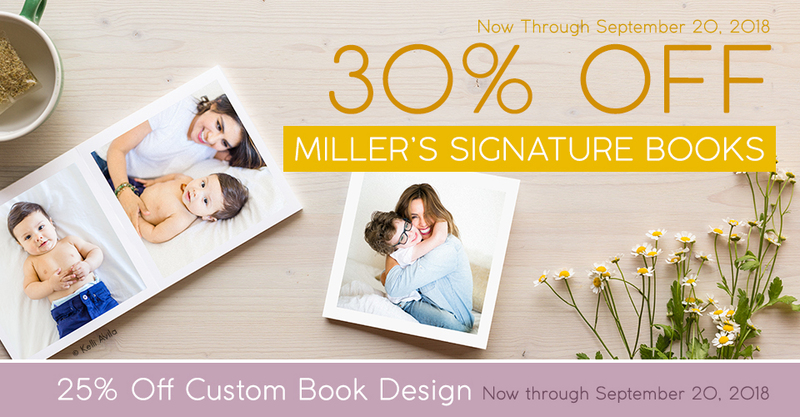 Please Note: This sale is valid for Miller’s Signature Books and Custom Designs only. Add-ons (Foil Stamping, Debossing) will not be discounted. Sample books do not receive additional discount (samples are discounted by 25%). This offer is available through web ordering, ROES, Designer Plus and Fundy Direct. No code necessary. The sale price will not be reflected in order summaries or email confirmations. The discount will appear once the order has been received by the lab. The cost of Custom Design does not include the cost of the physical albums or books. This offer is not valid on orders placed prior to the sale and custom designs must be approved during the sale. Offer expires at 11:59 p.m. (Central) on September 20th, 2018. *Exclusions apply for free overnight shipping, please visit here for additional details. Hi there. If you haven’t already, you will need to set up an account with Miller’s by using the form on this page: https://www.millerslab.com/signup. From there you will be able to add your card/payment details and place your order using the card on file. The sale is going on now and lasts until 11:59 p.m. (Central) on September 20, 2018.